Savvy waiver play can save your fantasy season. Fantasy Draft Mistakes: It's Not Cuffing Season. 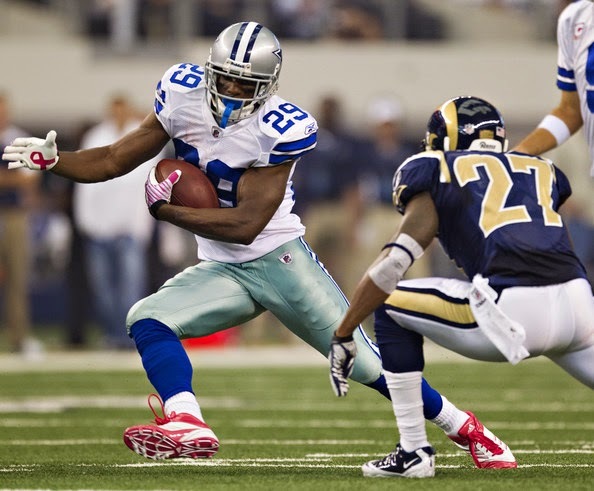 Are you thinking of handcuffing DeMarco Murray this season? Click here to view the 32nd Greatest Fantasy Franchise of All-Time. The Jacksonville Jaguars field the lowest scoring single-season fantasy lineup of all-time. Blame it on the expansion draft, blame it on Florida, or blame Gabbert. The Jaguars just haven't had many standout fantasy players. The Tampa Bay Buccaneers are known for being the worst. The franchise holds NFL records for longest-losing-streak (26 games), most consecutive 10-loss seasons (12 seasons), and was the last franchise to return a kickoff for a touchdown. Tampa generally finds their way to the bottom, and their 31st place ranking among the greatest fantasy football franchises is par for the course. When was the last time a member of the New York Jets was drafted in the first-round of your fantasy league? Sure the Jets aren't the lowest scoring fantasy franchise of all-time, but one would expect more from an original AFL team. Ranking 29th out of a possible 32 isn't so bad when you take into consideration the Houston Texans have only been around for 12 years. What's even more surprising is that the NFL used to function with just 31 teams. We're not exactly sure how that worked, but we are sure that there were some stellar Texans that elevated the new guys in Houston to the 29th spot on our countdown. We'd bet that the Cincinnati Bengals' 28th place ranking is the result of playing the Pittsburgh Steelers and Baltimore Ravens twice a year since 2002. Four games equate to a quarter of NFL season, which means the Bengals have spent a lot of time against top defenses. Scroll down to see the Bengals the NFL couldn't keep in check. The Pittsburgh Steelers are ranked 27th on our countdown. Again, we have another franchise with years of history whose offense has likely been stifled as a result of playing in the defensively minded AFC North during the fantasy era of football. The Baltimore Ravens rank in at number 26. Are you noticing the trend? Fantasy points do not come easy in the AFC North. It's even harder when the team has only been around since 1996. Despite the roadblocks, the Ravens finished 2nd in the AFC North on our countdown. As we take a break from the AFC North, we head into the best defensive division in the NFC, the NFC West. The Arizona Cardinals rank 25th on our countdown and their lineup is unique compared to the rest of the teams on our countdown. Scroll down to view Arizona's dubious distinction. The Chicago Bears have never been known for their offensive prowess and it shows given their 24th ranked fantasy squad. There are some familiar faces, favorites, and all-time-greats on this list. Scroll down to find out who made the All-Time Fantasy Bears. The 2013 Superbowl Champion Seattle Seahawks rank 23rd on our greatest fantasy franchise countdown. Only 1.2 fantasy points separate them from the 22nd ranked Chicago Bears. Scroll down to view the All-Time Fantasy Seahawks that edged them ahead. The Buffalo Bills rank in at number 22 on our countdown and boast some familiar talent from your memories of pre-millennial football. While it's likely that some Bills will be drafted in your league, we'd avoid most members of the 2014 squad until the later rounds. Our sincerest apologies if you were spoiled by C.J. Spiller in 2013. Guess Who: Name the Two Bills from the last decade (2004-2014) that made the team. The New York Giants are the 21st ranked All-Time Fantasy team in our countdown. This is something to keep in mind as you approach your 2014 Fantasy Draft. Don't bELIeve the NFC EAST hype. Unsung Hero: Giants Quarterback in 1967 - GUESS WHO?